This document is in three parts. The first part concerns overall objectives in relation to the conservation of natural resources which the Government would like to see encompassed in a Landcare South Africa movement. This movement will be built from community-based initiatives within provincial structures and involve strong private sector and civil society participation. As this process takes place, attention will be given to the formation of national structures to institutionalise LandCare South Africa. The second part of the document concerns the individual components of the Government's programme to promote land care over the next three years. All of these components are designed to lay the foundation of community involvement and wider participation in conservation. One of the componentawareness hasbeen given specific responsibility for developing initiatives which will formally establish Landcare South Africa within the next three years. The third part of the document concerns the organisational structure within which these government programmes will be implemented; and it provides a basis for developing links with civil society representatives, universities, etc which, in turn, are expected to evolve into the structures of Landcare South Africa. In summary, LandCare South Africa will be a community-based programme supported by both the public and private sector through a series of partnerships. It is a process focused on the conservation of the natural resources (soil, water and vegetation) through sustainable utilisation and the creation of a conservation ethic through education and awareness. In addition, it seeks to address rural poverty by means of sustainable job creation. As a first step towards establishing LandCare South Africa, the Government is initiating a landcare programme with five components (described below). This implementation framework is primarily concerned with the latter, which includes ways to establish local and national LandCare structures as a building block of LandCare South Africa. LandCare South Africa and the Gorvenments land-care initiatives will also be guided by international conventions to which we are party and signatories. These include the Convention on Wetlands of International Importance (RAMSAR), the Convention to Combat Desertification, the Convention on Biological Diversity and the Framework Convention on Climate Change. "To facilitate allocation of land to the uses that provide the greatest sustainable benefits and to promote the transition to a sustainable and integrated management of land resources. In doing so, environmental, social and economic issues should be taken into consideration. Protected areas, private property rights, the rights of indigenous peoples and their communities and other local communities and the economic role of women in agriculture and rural development, among other issues, should also be taken into account."  Create a facilitating framework through the instruments of legislation (enabling, administrative and regulatory) and policy, including appropriate incentives and dis-incentives.  Review existing international, regional and national policies, legislation, regulations and programme; so as to adhere to international standards and the development of new national criteria.  Optimise productivity and sustainability of resources resulting in greater productivity, food security, job creation and a better quality of life by introducing both regulatory and nonregulatory measures including economic incentives.  Place greater emphasis on education and promotion with regard to sustainable farming practices. The programme is targeted farming groups (commercial and small, medium and communal farmers) associated with exploitive farming practices and limited resources for implementing corrective measures. Additional beneficiaries will be the rural poor, through job creation and transfer of skills and knowledge. The NGOs and civil society will complement Government efforts in the implementation of its LandCare Programme through provision of additional resources (financial, technical and human). In the face of perceived needs, NGOs will be important sources of technical expertise and offer training to local communities. They will also assist communities in the selection, designing, implementing and monitoring of LandCare projects and provide a link between project initiators, Government and funding agencies interested in LandCare projects. Their entry points will be the provincial LandCare co-ordinators. The overall goal of the LandCare Programme is to optimise productivity and sustainability of resources so as to result in greater productivity, food security, job creation and a better quality of life for all. The eight immediate objectives of the LandCare Programme are listed in Box 1. Maintain biodiversity (contribute towards the maintenance of biodiversity). The operational procedures of the programme are guided by the operational principles listed in Box 2. Through public spending, including both capital spending and reorienting staff resources and programmes towards conservation objectives . Through the design of incentive policies, and the removal of disincentives. During the next three years, the Government will initiate five major programmes. Their links to civil society contributions are summarised in Table 1 (see Box 3). The development of the LandCare Programme consists of five (5) programme elements including both implementation projects and activities required to achieve the goals for the development of the programme (see implementation programmes in annexure A). Major works programmes for Resource Conservation. For each province the major concerns about sustainable resource use will be identified and specific projects developed to address these needs. This projects will be designed to create jobs. Capacity building of local communities and support staff The purpose of this programme element is to provide capacity building for local communities and support staff. This will be communication and information strategy geared primarily for the farmers and secondarily for the broader land-user communities and also young people. This programme will be geared for the formulation of policy and legislation that deal with incentives and disincentives on natural resource management. It is the purpose of this programme element to establish and implement, on a continuing basis, a monitoring/evaluation system to monitor progress, assess emerging and changing needs, and to provide a basis for planning and research. For each province, the major concerns for sustainable resource use will be identified and specific projects will be developed to address these needs. Altogether 60 % of the overall budget for the programme on the assumption that additional funding is made available for LandCare. The purpose of this programme element is to provide education and to support community participation in resource conservation and management of LandCare activities. Education and assistance are crucial in achieving effective community structures and participation in the whole LandCare Programme. The responsibility for undertaking community motivation and education, and achieving effective community participation is vested in extension workers, resource conservation officers/inspectors and NGOs in the field. The field staff will become involved in major works for resource conservation and poverty-relief public works at the earliest stage of project development in collaboration with LandCare coordinators. The government officers will also work with NGOs to provide this component of their projects when necessary. Supportive education materials on Resource Conservation have to be designed and produced with the assistance of all stakeholders for use in communities.  Empower local people to make their own decisions.  Ensure that the principles of conservation, sustainable resource use and maintenance of biodiversity are effectively incorporated into their farming systems.  Promote through participation, sustainable natural-resource management by farmers.  Strengthen and/or develop local institutions that foster effective, democratic, and sustainable control of resource users interactions between the environment and the adopted farming systems.  Encourage natural-resource monitoring at grass roots.  Empower LandCare coordinators and groups on proper procedure for equitable distribution of LandCare job-creation projects and their management.  Develop entrepreneurial skills at grass roots.  Monitoring and evaluation of their own success i.e. setting up LandCare initiatives for success. In addition, this programme element seeks to consult with provincial Departments of Agriculture, the National Department of Agriculture to promote a comprehensive restructuring of extension services and extension training facilities in order to integrate primary-level conservation and production-advisory services. The Directorate Agricultural Resource Conservation of the National Department of Agriculture will coordinate resource conservation education activities. The farmer support services will be responsible primarily for providing resource-conservation education and helping communities organise their participation. Where available and appropriate, NGOs and Community Based Organisations working with the province/local government will assist with community organisation and participation. Resource-conservation education materials will be produced by the Directorate Agricultural Resource Conservation in collaboration with other stakeholders. Funding is required for the production of the education modules and the cost is expected to be 20 % of the budget allocation. Interdepartmental and provincial coordination is critical for optimum usage of resources. The purpose of the awareness programme is to promote understanding of factors which can lead to unsustainable use of resources in agriculture and of policies and institutions which can address this. The National and Provincial Departments of Agriculture. in collaboration with the Department of Education and Department of Environmental Affairs and Tourism (DEAT), will coordinate this programme. This programme will be geared towards the formulation of policy and legislation dealing with incentives and disincentives on natural-resource management. The National Department of Agriculture in collaboration with the Department of Land Affairs will implement this component. The new research priority will be to develop and extend relatively simple, low-cost responses to natural-resource degradation and basic rural needs. It is also the purpose of this programme element to establish and implement, on a continuing basis, a monitoring/evaluation system to monitor progress, assess emerging and changing needs, and to provide basis for planning and research. The programme will incorporate assessment of the economic costs and benefits of resource-conservation measures. The organisational structure is designed to foster national and provincial ownership of the government LandCare Programme and to ensure integration of its activities into priority ongoing national agricultural development programmes. 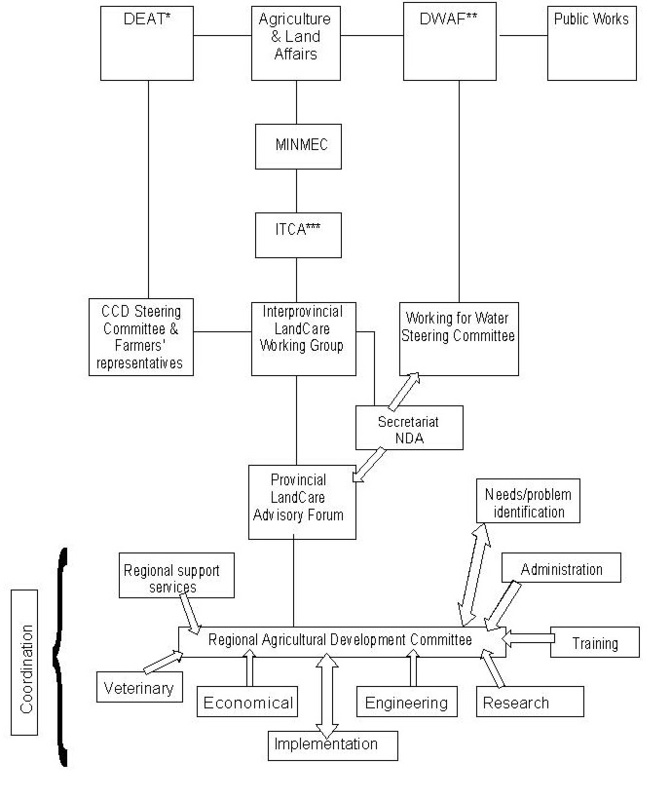 The structure inter-links national and provincial departments of agriculture, NGOs and civil society, as indicated in Figure 1. DEAT is responsible for coordinating the implementation of international conventions, including the Convention to Combat Desertification. LandCare will have strong linkages with Integrated Catchment Management proposed in the new Water Bill. The MINMEC is the forum for the National Minister for Agriculture together with the MECs for Agriculture and it is the political governing body for the LandCare Programme. ITCA is the technical and administrative arm of the MINMEC, and the Director-General is the principal executing officer of the programme.  Foster policy and institutional linkages and adjustments for the institutionalisation of the systems and participatory approach. The PLAFs are the provincial governance bodies of the programme and are expected to provide a basis for LandCare South Africa in due course. Supports the Interprovincial LandCare Working Group in carrying out its responsibilities and functions. Awareness, building vision, coordination and support for LandCare will bring coherence to planned actions and sustain the programme. Foster a sustainable programme for working arrangements between the communities and the implementing organisations (in this case they will initially be Provincial Departments of Agriculture). Liaison lines need to be secured. Provincial and national institutional capacity to manage the LandCare Programme needs to be developed. It is important that managerial capability within the Provincial Departments of Agriculture is enhanced. Participatory planning that includes formation/enhancement of LandCare groups to the common concern of the group and their opinion could be identified. This is necessary so that there is agreement on the vision of LandCare, the bounds of the catchment/LandCare group and also to gain local commitment for future land management. Within the groups of organisations the community can establish community-based land-use plans so that the extent of land degradation, land management and resource-use constraints and LandCare needs can be assessed. Constructed land rehabilitation on-ground physical works and established land-management entrepreneurial and supporting projects. Promotions of value-adding physical on-ground works that will further demonstrate the benefits of LandCare, land management and sustainable resource utilisation. Establish community agricultural/natural resource neighbourhood watch with the aim to guard land from sliding back to an undesired state. An awareness programme that includes the compiling of "state of the area" reports that prompt intervention by modifying land- management practices, will form an integral part of the neighbourhood watch. Develop community-based LandCare information system. The system will be designed to support both existing and future activities of a specific community. The information system will also serve as a decision support system for the Provincial Department of Agriculture and agriculture extensionists. Developing supporting resource-conservation education materials and modules, which will be designed and produced in collaboration with the Department of Environmental Affairs and Tourism. These modules and materials will also be enriched by the products from the "building from below" processes that will be developed by the Institute of Natural Resources. It is envisaged that training products will be fine-tuned by a review process with other departments and NGOs. Field staff will be oriented with the "building from below" processes of LandCare. The staff will use the procedures and principles of this process to support the major works for resource conservation, the poverty-relief public works in collaboration with other LandCare coordinators. Further motivation for community participation will be achieved through media support. The products of the education programme as well as the education material will be made available through the public media. Building a collegial ethos of extension service in support of a sustainable agricultural production system. The extension services should form a programme, which has its focus on sustainable agriculture and rural development, necessitating structural transformation in order to enhance production, to improve food security and reduce poverty. This process should be conceived as a comprehensive development approach where the criteria of efficiency, equity and sustainability are carefully integrated within a coherent and operational framework. Promoting the extension and advisory functions of agricultural service, industries, NGOs, CBOs andabove allof farmers in support of other farmers. Revising extension-training curricula to reflect current policy on support to sustainable resource use and gender sensitivity in extension service i.e. provision of refresher and training courses for extension workers who are already in service. In addition, LandCare coordinators and implementing agents will need training in skills of financial management, business principles and project management. Sustainable land and management farming systems will require retraining of the agricultural support services. These could be skills such as grazing management, erosion control systems, forage management and other entrepreneurial skills. Specific technology required for effective resource management will be researched and assembled, as well as a procedure for transferring the technology to all the farmers and other land users involved. The following procedures will be undertaken as simple and effective ways of monitoring area/catchment health. Baseline studies will be carried out at the beginning of the programme for each of the aspects below. All surveys will incorporate community-defined indicators (indigenous-knowledge indicators) for catchment degradation and subsequently improvement. It is proposed that the recently modified universal soil equation in which GIS-based digital terrain models are employed to estimate the mean annual sediment yields from each subcatchment, will be used. (This will give an estimation of these sediment yields before and after implementation of LandCare.) This will demonstrate very simply and convincingly the impact the LandCare initiative is having in reducing sediment yields as a result of improved land cover. Other methods that will be used in collaboration include approaches such as estimated phosphorus and E. coli-pollution levels. The water quality in the catchment will also be monitored through direct water-quality measurements of water sources by schools and the community. Particularly high school pupils will be involved. They will collect water samples at strategic points within the catchment and the turbidity tests will be conducted to assess sediment loads. The increase in land cover means that the soil surface will be protected from the erosive impact of raindrops. The erosive capacity of runoff is also reduced as most of the sediment will settle within the vegetation, thereby reducing the sediment yield from the catchment into the river system of the catchment. A significant reduction in sediment yields will translate into a longer life span of the wetland as the siltation rate will be reduced proportionately. The number of wetlands was reduced significantly as a result of silting up by sediments from the catchment. Wetlands are biodiversity hotspots (inhabited by a large number of species) and need to be conserved. The siltation rates of wetlands in the catchment will be monitored before and after plant cover of the catchment has been removed. Over time an increase in the number of wetland areas will be documented. This will include a stream habitat survey and benthic macroinvertebrate surveys. Invertebrates are useful indicators of the ecological status of an area because of their ubiquity, abundance, rapid life cycles and importance in food chains. In rivers, their presence reflects conditions upstream. As water quality improves (reduction in sediment yields, phosphorus pollution, etc) with the implementation of LandCare in the catchment species composition and abundance of benthic invertebrates will change, reflecting the improvement in water quality. The study hence proposes to monitor these changes. Monitoring of species diversity both on land and water. An initial assessment will be done to determine the indigenous species richness. Monitoring will be done on the presence and/or increase of indicator indigenous plant and animal species. Baseline information will be established. An assessment of the current situation regarding dependency on the natural resource base for survival; the current employment and sources of income, the current patterns of land use that contribute directly to the peoples livelihoods. Areas or communities where the poorest households are, should be included in the plan. The community should identify poor households by using their own identified indicators to indicate poverty. Assess to what extent do the wider or immediate objectives meet womens practical or strategic needs, e.g. improving their income through training or allowing them to take part in decision making about the projects, e.g. local committee membership; participation in elections for the project committee, setting payment of women at the same rate as that of men. Establish baseline information on the types of enterprises and incomes derived. Also baseline information on the purchases made in a specific period and compare them with a similar period in the course of the project.